The restitution of properties to legitimate owners marks Albania’s departure from its communist past and opens the way to european integration. The right to property is a fundamental right. Respect for the right to property is one of the main promisses of the Albanian State after the regime change in the early ’90ties. The right to property restitution for owners expropriated by the communist regime is furthermore enshrined in Articles 181 and 41 of the Albanian Constitution. Our vision is that this promisse finally becomes REALITY ! Return of properties to expropriated owners marks the detachment from communism and paves the way to Albania’s European integration. Our vision is that the Albanian State finally examines and solves the main communism-related problems: historical assessment of the communist regime, opening of old regime secret “files”, trial of those who committed crimes, restoration of the dignity of former political prisoners and respect for property rights of rightful owners . Our vision is that the Albanian State works in the interest of the people and the country, fights corruption and respects international commitments. Respect for the right to property is the “sezam” that paves the way to serious investment, economic development and welfare. It is the only way for Albania to join the European Union. And it can only be achieved through grassroots movement and international pressure. These are figures stated by the Police, the associations working to reconcile feuds and the Ombudsman. This is a war statement which should weigh heavily on the conscience of politicians, officials and judges. The current government, like the precedent one, is unwilling to return properties consfiscated during the communist regime and used since by the governing kleptocrats. The Governements strategy has been to postpone restitution another 20 years, while it should had been resolved already in 1993 accordint to law 7698 or at the latest in 2001 according to Article 181 of the Albanian Constitution. 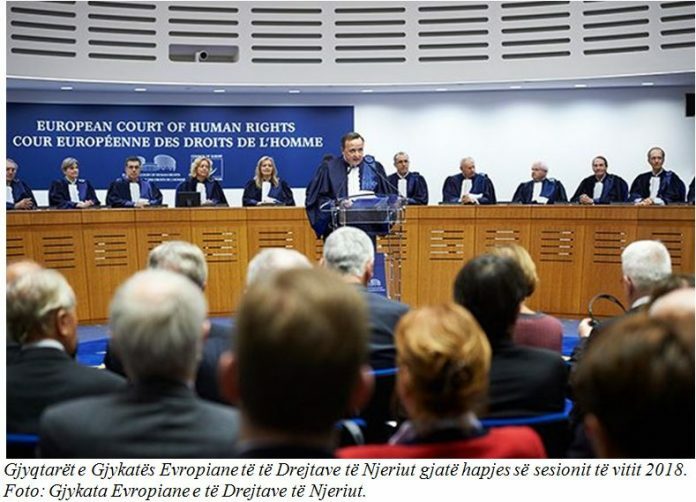 The Strasbourg Court has been asking the Albanian successive Governemnent to solve the property restitution issue since 2007. The number of cases presented by evicted owners to Strasbourg has increased in proportions that, if not solved quickly, may threaten the correct functioning of the Court. In this context, the ECtHT has adopted the “pilot judgment” procedure (see Puto and others against Albania, decision of July 2012). The Government was required to resolve what is qualified as a “systemic problem” within 18 months – i.e. by end 2013. However the Albanian government’s strategy foresees to postpone the solution of restitutions to 2020. At the same time the declared aim was to complete the “legalisation” of illegal buildings by the end of June 2014. By doing so the Government ignores not only the legitimate claims of rightful owners but also the Council of Europe/ECtHR and European Union requirements. Indeed respect for property rights is one of the pre-conditions to be fulfilled in order to start accession negotiations. Post-communist Albania continues to be governed by clans issued from the former communist elite. Such elites’ continuity has hindered the consideration of fundamental issues such as the historical examination of the communist period, the opening of secret “files” and the judging of those who committed crimes, the financial compensation of former political prisoners and the return of properties expropriated during the communist regime. Worse, several voices are heard that require the rehabilitation of the dictator, former criminals walk free and continue to prosper. They are given important official jobs and economic power. Former prisoners continue to be offended and rightful owners are dragged until they stop demanding their rights . Political power alternates from the self-declared right to the self-declared left. Abuses of property rights are a source of enrichment for corrupted officials and politicians. Monopols are another one. Albania does not respect the fundamental right to property, its economy is dominated by a few clans and we are far from a well-functioning market economy . Corruption in the judiciary is another problem. Logically, the country does not attract serious investors, the economy is doing bad, poverty has increased as have all the social problems that go with it: domestic violence against women, children and the elderly, mental health problems, homicides and suicides. The last 20 years Albania has not departed from its past and has not been able to lay healthy foundations for the future. Not because it is hard, but because it is run by elites who do not want such development and have taken our future hostage. This can only change through grassroots movement and international pressure.